Det. Steven McDonald was on life support most of his life, but what an inspirational life it was. McDonald, 59, was paralyzed and breathing with the help of a respirator since July 12, 1986, when he was shot three times in Central Park by 15-year-old robbery suspect, Shavod Jones, who McDonald later forgave and then tried to help return to society a better person. But since last Friday, when McDonald suffered a massive heart attack, he lay unconscious at a Long Island Hospital, where a steady stream of family and friends has visited, including a legion of people the wheel-chair bound detective has helped over the years overcome their adversities through various organizations and prayer groups. “So many people have been showing up who you can hear asking themselves, ‘How I am going to get on without him?’” Michael Palladino, president of the city’s detectives’ union, said a day before McDonald's wife, Patti Ann, and their son, Conor, an NYPD sergeant, made the courageous decision to stop the respirator that kept McDonald's enormous heart beating Tuesday afternoon and he drew his final breath at 1:09 p.m.
“It is hard to realize how much work he has done with, and for, people, and how encouraging and inspirational a figure he has been,” he added. 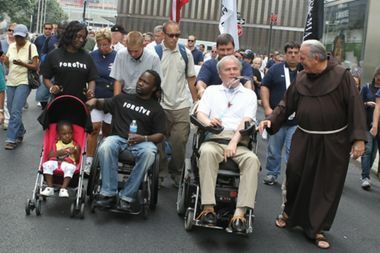 “He has accomplished more confined to a wheelchair than most people who are not,” the union president said. Just five months before McDonald was shot, Det. Kathy Burke was badly wounded by Genovese Crime Family mobsters and her partner, Anthony Venditti, was killed. She remembered sitting by McDonald’s hospital bedside in the days after he was paralyzed with fellow Officer Richard Pastorella, who was blinded by an FALN terrorist bomb at Police Headquarters on New Year’s Eve 1982. She recalled that McDonald kept saying he only wished he had the ability to yank out the electrical cords and medical lines “and unplug the machines." But she and Pastorella, both members of the newly created Police Self-Help Group, tried to encourage McDonald that he had much to live for since his young wife, Patti Ann, was four months pregnant. "Everyone was encouraging him that he was going to have a child, and he should want to have his child know who he is," she said. When Conor was born five months later, the only way McDonald could feel his son was when he was pressed up against his face. In 1987, McDonald chose Conor’s baptism to proclaim his forgiveness for Jones. "I forgive him and hope that he can find peace and purpose in his life,” he said in a statement read by Patti Ann at Bellevue Hospital. It was not long after that baptism that I first met McDonald and Patti Ann when they attended a Self-Help Group dinner and fundraiser in the basement of the St. Anselm Church in Brooklyn, where Monsignor Robert Romano, the NYPD priest, was head pastor. Watching the couple navigate an arduous obstacle course to the basement was to catch a tiny glimpse of their daily hardship. But talking to McDonald and hearing his message of forgiveness was to feel the presence of a divine spirit. He even declared that he hoped Jones would join him one day on a speaking tour in front of school children to make something good evolve from their ill-fated moment in Central Park. And there appeared to be a chance for that reunion when Jones called McDonald’s home from jail in 1990 and apologized. But the troubled Jones ultimately died in 1995 in a motorcycle accident just days after he was freed from prison. McDonald was one of eight children and a former high school football linebacker who served as a U.S. Navy medical corpsman before joining the NYPD in 1984, following his father, David, a sergeant, and grandfather. And his son, Conor, eventually joined the NYPD, and became a detective and then a sergeant. On the 30th anniversary of the shooting this past July, Conor posted a video on Facebook from his father, who expressed his thanks to everyone who supported him. "I never thought I’d be around this long," he said. "I’m very proud to be a part of the New York City Police Department — to be a friend, I’d like to believe — to all of you." "You will always have a place in my heart,” he concluded. Patti Ann, who is the Mayor of Malverne, Long Island and someone Palladino described as a "lifelong profile in courage," and Conor, returned to McDonald's bedside Tuesday morning to continue their heartbreaking vigil and say their final goodbyes surrounded by family and friends. His suffering finally ended, but his bright smile, sky blue eyes and inspiring manner will assuredly survive. A tall bronze statue of a police officer stands inside Police Headquarters, shielding a small boy and symbolizing how the police serve and protect the innocent. The NYPD would be well served to consider placing another statue alongside that sentry, one of McDonald in his wheelchair with a plaque forever reminding people of his unflinching sacrifice, forgiveness and compassion.